The last post had some background information on my Land Cover Atlas of the UK. In this post I'll say a bit more about it, answer some of the questions I received, and share some of the data from the project. As I said in my previous post, this was really about me trying to understand the data better and seeing if I could produce a localised atlas of land cover for the whole UK in a way that was accessible and comparable between areas. If you really want to know more about what I did, and the results of my analysis, I strongly recommend you see my more detailed Land Cover Atlas of the UK, including the Appendices. The piece on the BBC was a simplified version of this work, because it had to be. You just can't have giant, detailed maps on the BBC website in the same way you can on Figshare, where the full set of maps are hosted. That's why, after some discussion, we created a simplified four-class Corine map set, with one set of maps optimised for desktop (640 pixels wide) and another set optimised for mobiles (350 pixels wide). My heart did sink when I found out I'd have to do this but then again it was a good way to learn a few more tricks and the BBC graphics and data team are brilliant to work with. On the underlying classification itself, I decided to use Corine because I had always wanted to understand it better, but it's also open data and comparable across Europe, and over time - it goes back to 1990. This means that, in theory, you could repeat this kind of analysis for the whole of Europe over 20+ years. But don't hold your breath; I'm done with Corine for now. As I note in the Atlas, the categories themselves do require a little bit more investigation if you really want to make sense of things, as you can see in the extract below. On the four-fold simplified classification used on the BBC website, there was quite a bit of debate about this. We moved from using 'Artificial' (as Corine uses) to 'Built on' after some testing at the BBC suggested there was confusion about what 'artificial' actually meant. 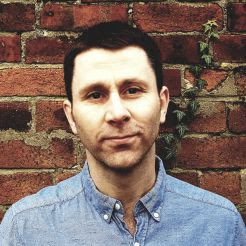 For 'natural', I think Mark Easton's blog piece did a good job of explaining that this must be interpreted with care. 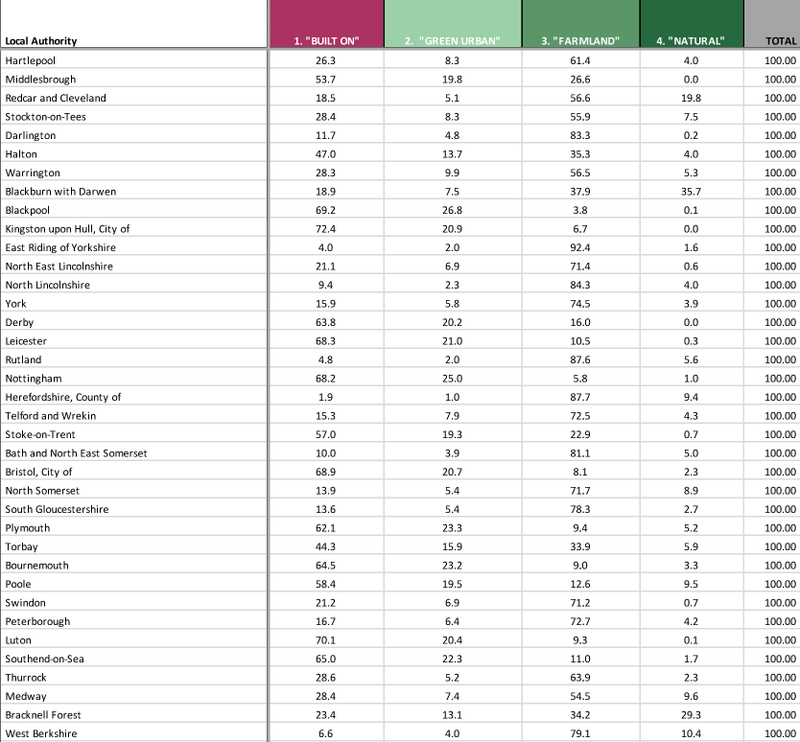 Ultimately, I thought that producing a localised land cover Atlas would be a good way of showing that when it comes to national averages, they don't always make sense locally. That is, the UK might be mostly farmland and semi-natural, but doesn't mean much if you are surrounded by a concrete jungle and are always stuck in traffic jams. 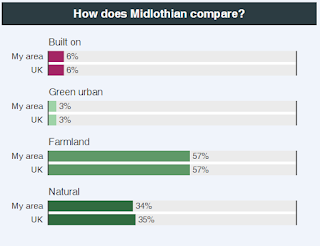 Having said that, I did discover that Midlothian was the local authority which most closely matched the overall UK land cover figures, almost exactly. Thus, 'the Midlothian question' is born. Doing something like this, if it will only be seen by a few interested boffins, is normally fine. But when it is on the BBC website millions of people might see it (and this was the case). That means you get a wide range of responses, from the 'oh cool, maps!' 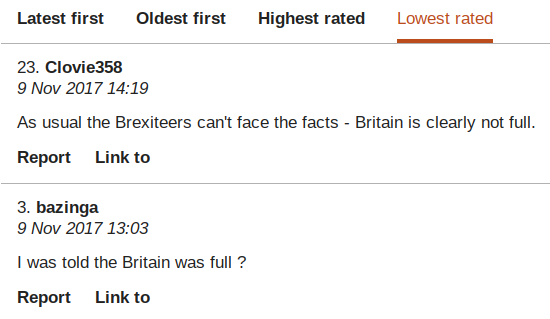 to the 'this is EU propaganda gone mad, the UK is basically a car park and I don't care what the numbers say'. But that's okay because most people are in the middle ground, though much closer to the first and, anyway, people are perfectly entitled to their opinions. What I thought I'd add here are some answers to common questions that were either asked directly or posted elsewhere online. 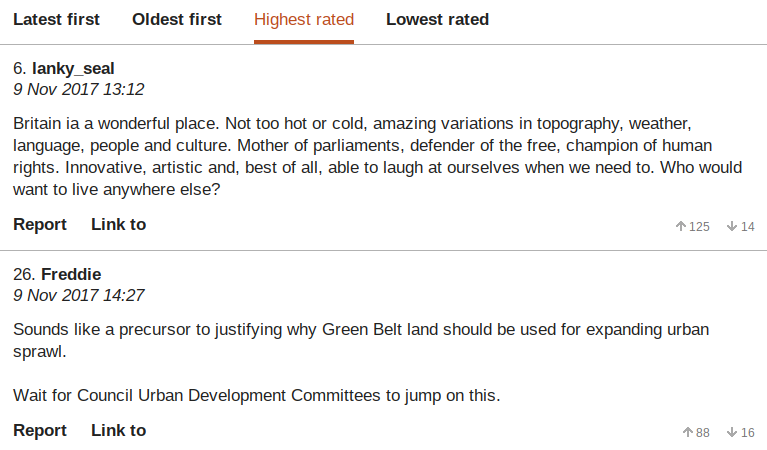 I wanted to know more about land cover across the UK. 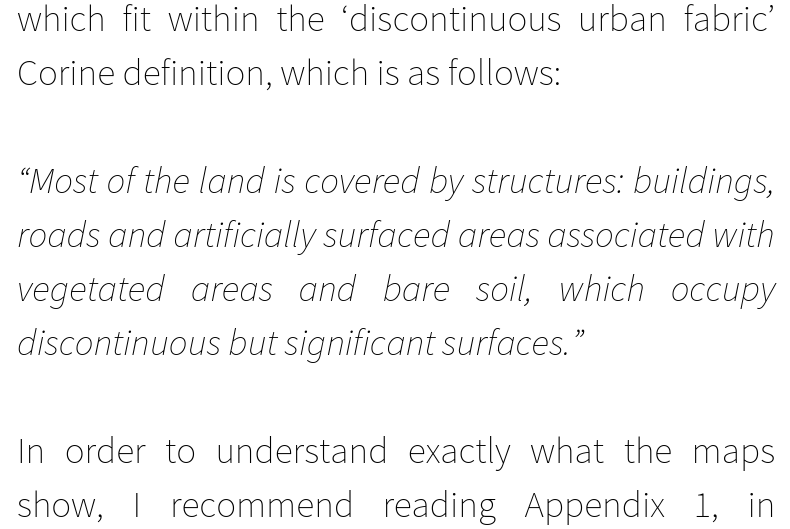 This was motivated by my desire to understand the country better in terms of land cover but also to see how much of it was actually artificial or 'concreted over' as some put it. The answer was about what I expected it to be but there is great variation locally and that's partly what I hoped to find - and to put some more precise figures on it. You really want to concrete over the whole of our beautiful countryside, don't you? But you're a secret housebuilding cheerleader, right? I do think we need to built more houses, and we do have space to build them if we want to, but the housing question was not part of this project. If it was, I would have tried somehow to look at 'developable' land or something like that. A key question in this is that for housebuilding there needs to be enough infrastructure and it needs to be in the right place. This kind of analysis could potentially help with that, but it wasn't my goal here. Was this funded by the EU? The data I used are created through an EU programme but neither the BBC nor I received any funding for this. I started this in my spare time (evenings and weekends) and although I used the Corine data provided by the EU (it's free and open data) this project definitely wasn't funded by the EU. How much did the BBC pay you? Nothing. We decided to use what I'd already done and then create a bespoke map and data set for their news website but I'd done the vast majority of the work already - Mark Easton and colleagues just thought it would be interesting and I see this as a useful kind of public engagement activity that adds to knowledge. If it gets more people interested in land and maps, then great. What do I think it tells us? Lots of things, but three come to mind - 1. there is more space in the UK than some of us might imagine. 2. We can find space for more housing if we want to. 3. We should probably get out and about more and enjoy the space that's out there. On 1, this is a question of where we live (i.e. 83% in urban areas) vs lots of land that can't really be lived on (e.g. the 9.5% or so that is peat bog) but I wasn't thinking it being about space for any one particular use. On 2, I didn't begin with a housing question but inevitably it comes up and when you look at it objectively you can easily find space, if you are willing. On 3, that's mainly just a message to myself but it also serves as a useful reminder that the UK is full of amazing landscapes. Maybe, just maybe, it also tells us that the way the population is distributed is something that needs to be looked at. But England has the highest population density in Europe so this data is meaningless, isn't it? Overall, in global terms, the UK is quite densely populated and within Europe the UK is now said to be the most densely populated. This data does not challenge that. It is about land cover, not people cover. The goal here is to show land cover, and it does show that some areas are very built up in percentage terms. Some areas may feel very crowded, but this is not just down to population numbers - it's also got to do with infrastructure, services and housing. And density is best thought of locally in my view, not at the national level. A simple national arithmetic average where you divide population by land area isn't very helpful. But I'm working on a more nuanced, meaningful metric for this that is based on a local density measure based on 1km squares. London is the most densely populated area in the UK - with an average of about 5,500 per sq km - and a high of about 25,000 - but it is much less dense than Manhattan or central Paris, for example. If I complain that the country is full, am I wrong? No. Yes. Maybe. Take your pick. The answer to this question depends upon people's perceptions, experience, and sometimes biases. I prefer to think about this question in relation to infrastructure, services, housing and international comparisons. 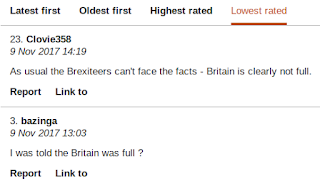 But if you were born in 1930, when the population of the UK was around 20 million lower than it is now, I can understand the point of view that the country is 'full', though I don't agree with it. However, my aim was to look at land cover, not population. It's inevitable that the population question comes up but I think some data on land cover is helpful in helping people understand the UK better. It means that someone looked at the EU's Corine data, turned it into localised maps for the UK's 391 local authorities and collaborated with the BBC to produce a simplified set of maps for the same areas. It is an attempt to take raw data and turn it into more meaningful information. The 'knowledge' bit will largely come from what people think to begin with or, in some cases, perhaps change people's perspectives. But for me it's about understanding how local areas compare to the national picture. Last of all, if you're looking for the underlying data, I've made it available in an open Google Drive folder. Here's what it looks like if you open it up in QGIS - and there are a few more screenshots in the folder. I have also put a 'Shapefiles etc' folder in there, which contains a QGIS project file you can open and see it styled as below (there's a qml style sheet in there too). If you're an ArcGIS user, you can use the layer file included in the same folder. There is also a UK local authorities file that I made, which should come in handy in providing a bit of context. 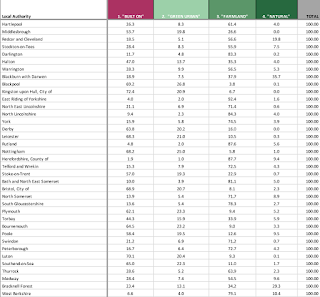 The other thing I've added to the folder is a spreadsheet with a summary of how much of each local authority is 'built on', etc. This just provides an opportunity to see the all map data in a single place. If you want to know how the land cover categories in this table translate to the original Corine classes, well it's relatively simple. 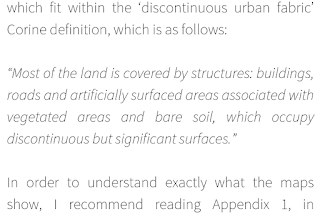 Although Corine has a 44 class nomenclature, at the most basic level it covers 5 classes - 'Artificial surfaces', 'Agricultural areas', 'Forest and semi-natural areas', 'Wetlands' and 'Water bodies'. In the simplified classification, 'Artificial' became (1) 'Built on', but without 1.4.1 and 1.4.2 ('green urban areas' and 'sport and leisure facilities'), which became their own class of (2) 'Green urban'. 'Agricultural' became (3) 'Farmland', and the rest were put into (4) 'Natural', though of course some of it is certainly not 'natural'. I hope some of this is useful and that it makes people think. But really, of course, I'd rather you look at my more detailed Atlas because that's where all this started. 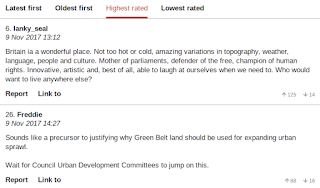 I'll end with a small sample of comments from Mark Easton's blog because I think they are a reasonable representation of the kinds of reactions there have been, and they also highlight the fact that land, population and statistics can sometimes be an intoxicating combination. Nick Faldo, is that you? Right, enough on land cover for now.